What is Grade D Breathing Air? The Occupational Safety and Health Administration (OSHA) standard 1910.134 requires employers to provide employees using atmosphere-supplying respirators (compressed air) with breathing gases of high purity. This is further defined by the American National Standards Institute (ANSI) specification G-7.1-1989 which details proper levels of Oxygen, Hydrocarbon, CO, and CO2. 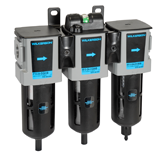 *This 3 stage filtration system is only a portion of a complete Grade D breathing air system and should be used as such. Using these products does not guarantee Grade D breathing air. Quality of downstream air is dependent on the supply air. CO levels should be continuously monitored with audible and visual alarms. Air quality should be checked regularly to confirm Grade D specifications per OSHA 29CFR1910.134. What is "Point of Attachment"?